StarWind VSAN New release built of version V8, build 12585, is out. 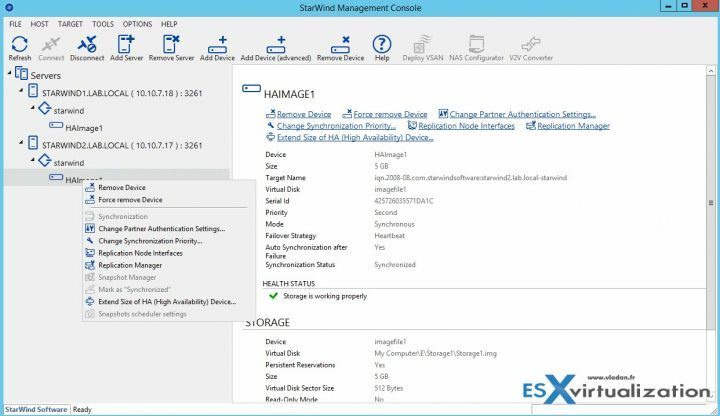 The new release brings quite a few changes to StarWind's flagship product. We'll look at those in this post. StarWind VSAN is a solution for virtual environment running VMware, Microsoft, KVM or XenServer. We have written about their flexible and robust solution on many occasions. StarWind was always a Windows shop when it comes to underlying OS. However, things have changed and now the products also support Linux as a pre-built Linux appliance for customers willing to save some money on Microsoft Licensing or simply going the Linux way. StarWind is very flexible and it's possible to adapt the solution to multiple different installations, including storage only (without hyper-convergence). As such, it only depends on the needs. The StarWind free version has unlimited capacity, with a trial period of 30 days. It has a multi-tiered server-side caching is available out of the box, scale-up and scale-out are both allowed, VTL is not included. The Free version can be deployed on a bare-metal Windows Server or installed inside a virtual machine. The management console works during 30 days and then the only management options are the Command line (Windows PowerShell), VVOLs, SMI-S.
What's new in StarWind VSAN v8.0 build 12585? VTL and Cloud Replication – Newly there is a support for LTO8 tape devices. FYI, The new LTO generation 8 specifications will double the tape cartridge capacity from the previous LTO generation 7, with customers now being able to store up to 30TB of compressed data per cartridge. 12TB Native and up to 30TB compressed. New PowerShell commands for managing VTL devices and Cloud Replication settings – new cmdlets helps to script configurations and installation on larger infrastructures. New Simple NVMf Target can be created for demonstration purposes – The existing NVMf initiator can be used now to connect the target. New Simple RAM Disk and Flat Storage devices – You can now create new simple ARM disk and flat storage devices with support for Mellanox RDMA-enabled network adapters with the latest drivers from the manufacturer (recommended). Other adapters that provide the NetworkDirect API layer can be used. Please take into account that StarWind VSAN installation process overwrites NVMf Target configuration file (nvmf.conf). If an old nvmf.conf file exists before installation, it will be saved as nvmf.conf.bak. Note: Unless the used StarWind Virtual SAN version supports the feature, download the new one and request the new license key. This works for Free and Trial licenses too. Synchronous Replication – There is a new fix where there was in some situations a 100% CPU load issue. Before, when HA device started working under irregular workloads, sync channel transport would load one CPU core by 100% in some cases. If the number of sync channels is the same as the number of server CPU cores, it could make the service unresponsive. Other useful links were added to the Help menu. I think it's much easier for the updates to be pushed online too. Core – Fixed service start crashes in systems where NVMe devices are present. Download StarWind Free Trial Here. In a production environment, no matter which hypervisor you’ll use for X reasons there are still the same rules to respect. Use certified hardware, with certified vendor solution which you have support for. I personally would not recommend using uncertified hardware or free solution for production. You know, when everything works, it’s ok. But when something goes sideways…..
Hello. How to upgrade from an earlier version, if have the Linux appliance installed on both hosts? Well, you should work with StarWind support or get help via StarWind community forums.